Adam Streur Photography was kind enough to follow me around backstage and onto the runway the evening of Omaha Fashion Week Finale. Here, I have posted some of his beautiful photos. Please respect his artistry and don't re-post or publish these photos without his permission/proper credentials. Contact Adam at photos@adamstreur.com about availability, rates or any other questions! 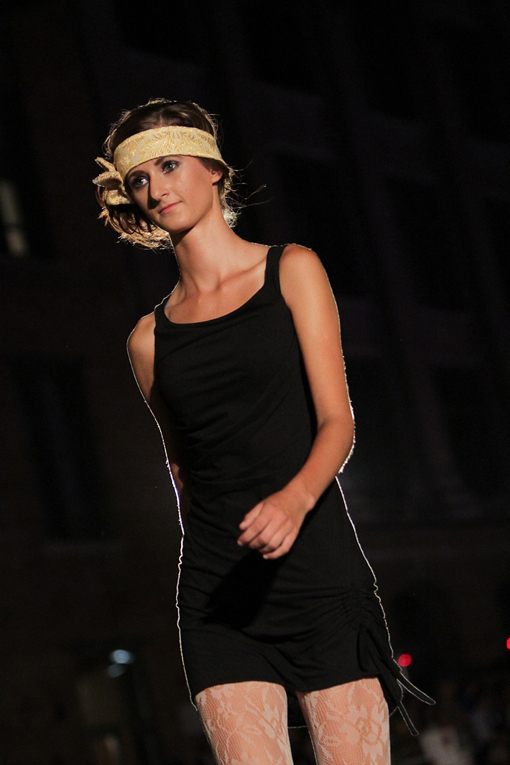 This is the collection I showed at Omaha Fashion Week Finale on Saturday August 27th. 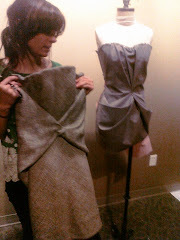 My fabric choices consisted of organic cotton, recycled polyester, hemp, bamboo/organic cotton jersey and featured one silk taffeta draped corset dress. I also used a green and cream stripe overlaid with blush bridal mesh. I experimented with color-blocking a "wave" print with a black recycled polyester/organic cotton twill. 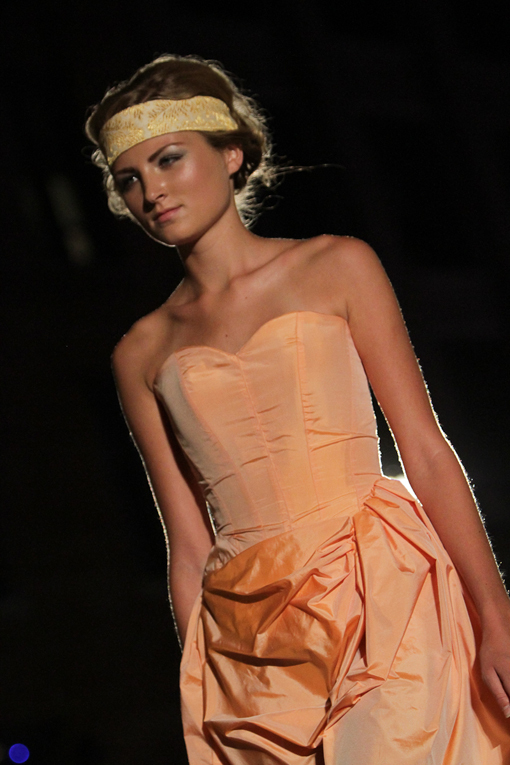 I used mostly vintage metal zippers and made the headbands out of Omaha sourced vintage fabrics. Omaha Fashion Week Finale was a huge success. The weather was beautiful. Every chair was filled and the audience was buzzing with excitement. The runway was the perfect length. All 4,700 Finale guests seemed to have a stunning view. Jones street was transformed that night... you had to be there to believe it. Backstage we were in a beautiful room at the top of the Old Market Lofts. There were floor to ceiling windows that let in lots of natural light as we were getting ready. My amazing hair and makeup team was lead by Rebecca Forsyth (@glamourpurveyor) of Bungalow 8. She was supported by Elliot Dougherty and Katie Hanke of Bangs. The hair was everything I wanted it to be... beautiful side buns--basically piles of curls! I had an absolute dream team and could not be happier with the results. I have so many more surprises to share, namely my experience meeting Mondo Guerra of Project Runway Season 8 and Kat Williams of Rock N Roll Bride (the highest trafficked wedding blog in the UK)!! Spectacular photos - I may have to borrow a few for my blog post. Once again it was a great experience being there - such energy, so much lovely and funky in one place. You are the top! I loved it. Emma, I missed seeing work with Quinn this year! Love your new collection! Hope you are getting the stellar response to your designs that you deserve! Can't wait to see what you do next. Thank you so much, Janet! I also missed Quinn and her perfect curls! The response has been good, I am working on a bunch of orders right now. Let me know if Quinn is interested in walking for me during Omaha Fashion Week Fall 2012 (shows are scheduled for the end of March). Thank you again for the support! I always love seeing Quinn's latest work.